Here's the real story of what happened to those innocent sailors who were murdered in cold blood by America's ally. On June 8, 1967, 34 American servicemen were slaughtered and 173 more wounded after Israeli forces repeatedly attacked the USS Liberty in international waters. The Liberty was not a battleship and was entirely unable to defend itself as the hours-long assault took place. For decades, the US government threatened the survivors with jail if they spoke about it and kept the truth from the public. Although Israel apologized for the devastating attacks and maintained that a simple misidentification caused the strikes, startlingly new evidence has surfaced that refutes Israeli claims that this attack was done in error and that the Israelis were unaware they were attacking an American Navy vessel. The USS Liberty incident was an attack on a U.S. Navy intelligence ship in international waters about 12.5 nautical miles from the coast of the Sinai Peninsula, north of El Arish, by Israeli fighter planes and torpedo boats. It occurred during the Six-Day War, a conflict between Israel and the Arab states of Egypt, Jordan, and Syria. The Israeli attack killed 34 U.S. servicemen and wounded at least 173. The attack was the second deadliest against a U.S. Naval vessel since the end of World War II and marked the single greatest loss of life by the U.S. Intelligence Community. The new evidence exposed in a documentary called “The Day Israel Attacked America,” by award-winning British filmmaker Richard Belfield, includes audio that proves the Israelis knew they were attacking a U.S. ship. Survivors of the attack have long maintained that Israel intended to kill the entire crew and sink the USS Liberty as a means of scapegoating blame for the incident onto Egypt. But why would Israel want the U.S. to believe that Egypt was responsible you ask? The answer would be found in what is know as a ‘false flag’ attack, which was meant to shift the blame for an incident as a means of drawing President Lyndon Johnson and the U.S. public into declaring war on Egypt. The attack on the USS Liberty lasted for over two hours, but just sixteen minutes after the attacks had begun audio evidence confirms that the Israelis knew the identity as that of an American vessel. These recordings can be heard in the documentary, which aired on Al Jazeera. Yet the attacks continued for another hour and forty-five minutes! Five minutes prior to the commencing of the attack, Israeli Air Force pilots can be heard questioning whether the ship was an American vessel. The first torpedo hit the USS Liberty twenty minutes after a ground controller confirmed to Israeli Air Force pilots that the ship was indeed part o the U.S. Navy. Incredibly, even after the confirmation that it was an American ship, a voice can be heard clearly confirming that the ship is to be destroyed – remember this is after the ship has been identified as American craft. After the initial torpedo struck the Liberty, torpedo boats circled and strafed the vessel with machinegun fire, gunning down American sailors attempting to flee the damaged vessel in lifeboats — a war crime according to the Geneva convention. Over a decade ago, a journalist named Arieh O’Sullivan from the Jerusalem Post was given access to these same audio recordings and published a transcript of the Israeli military transmissions that could be heard directing the ongoing attack. His analysis of the recording was almost exactly the same as that of the documentary, as sixteen minutes after the attack started, just as in the recording obtained by Al Jazeera, O’Sullivan’s transcript reveals the same exchange. Oddly, the O’Sullivan’s transcript ends here even though the attack continued for another hour and a half. An independent commission tasked with investigating the incident, and headed by Navy Admiral Thomas Moorer, who served this country as Chairman of the Joint Chiefs of Staff and Chief of Naval Operations, publicly released the commission’s shocking findings in 2003. -The attack, by a U.S. ally, was a deliberate attempt to destroy an American ship and kill its entire crew. -The attack included the machine-gunning of stretcher-bearers and life-rafts . -The White House deliberately prevented the U.S. Navy from coming to the defense of the USS Liberty. -This was the first time in naval history a rescue mission had been cancelled while an American ship was under attack. In what CIA analyst Ray McGovern called the ‘most detailed and accurate account of the Israeli attack,’ John Crewsdon, a Pulitzer Prize-winning journalist, published his in-depth analysis for the Chicago Tribune only to be fired a year later – after being employed there for 24 years. “Israeli messages intercepted on June 8, 1967, leave no doubt that sinking the USS Liberty was the mission assigned to the attacking Israeli warplanes and torpedo boats as the Six-Day War raged in the Middle East. 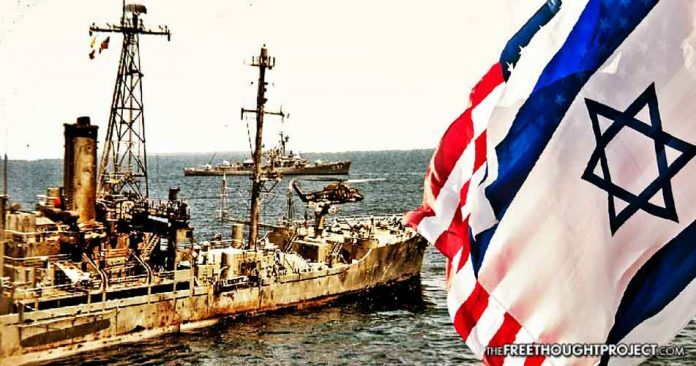 Let me repeat: there is no doubt – none – that the mission of the Israeli Defense Forces (IDF) was to destroy the USS Liberty and kill its entire crew.” – former CIA analyst Ray McGovern. The Free Thought Project recently attended a speaking event by Jack Beattie and Bryce Lockwood, a Naval seaman and a Marine who were on the USS Liberty when it was attacked. In the video below, Beattie gives his description of events that occurred that day. He confirms that the ship was clearly labeled as American and the flag was flying. He also recalls how the fighter jets were firing on people in life rafts and how the ship was almost completely defenseless. At the end of his talk, Beattie then explains how everyone on the ship was told that if they talk about what happened, they will be thrown in prison. Here is the real story of the USS Liberty.